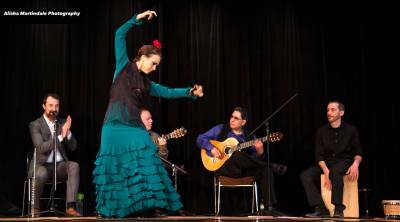 Celebrating its 25th anniversary in style, The Val Ramos Flamenco Ensemble will perform a concert of great Flamenco music, song, and dance! Hailed as "(t)he best of classical Flamenco brought to modern standards" (Rootsworld) and "A hidden treasure of Flamenco in the Americas...Superb musicianship" (Flamenco Connection), the group will perform a concert on Saturday, May 11, 2019 at 7:00 p.m. featuring the talents of VAL RAMOS and JOSE RAMOS on guitars, BARBARA MARTINEZ (Flamenco singer), REBECA TOMAS (Flamenco dancer), KRIS JENSEN (on flute), ASHLEY JONES (on violin), CARLOS HERNANDEZ CHAVEZ (on bass), MATT MOADEL (on percussion), and TERE LUNA (vocalist). The Val Ramos Flamenco Ensemble is widely acclaimed as one of the best in the United States, having performed to standing ovations at the Litchfield Jazz Festival, International Festival of Arts & Ideas, Levitt Pavilion Summer Concert Series, Guitar Under the Stars Festival, Summerwind Concert Series, and Regattabar Spring Jazz Festival, to name a few. The group toured in Spain in 2005 under the auspices of the United States Embassy in Spain. This concert performance will artfully blend the soulful and colorful traditional Flamenco singing and dance with the modern Flamenco fusion instrumental elements for a unique musical experience. The concert is produced by PIRAM Flamenco Productions.